This week’s picture was taken during a fun bike ride along the Falls Lake Dam this past Sunday. I’ve been doing a lot of running as I train for the City of Oaks Marathon and biking the day after my long runs is a great way to shake out the kinks in my legs. One of my favorite places to bike is along the dam with great views of the lake on one side and the Neuse River on the other. 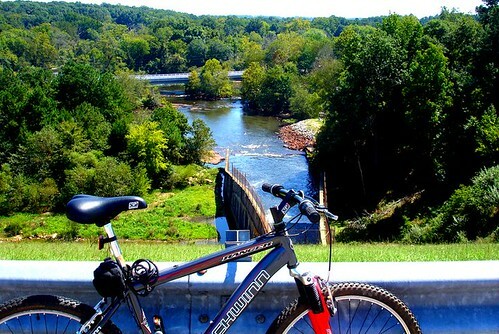 You can also easily connect to the Neuse Greenway which provides for a great 6.5 mile ride along the river from the dam to the WRAL soccer park on Reedy Creek Road. Great picture! How is your training coming along for Oaks?